The future of health and fitness is here! You’ve no doubt seen the debates – what sort of diet is best? Should I be eating Low Carb-High Fat? Are low-fat diets still best? Should I be doing power, strength, HIIT training or will cardio give me the best results? The simple answer is that due to our DNA, we are all different, and respond in different ways… There simply is no ‘one size fits all’ solution. However, Gene Testing takes all the guesswork out of exercise prescription and diet. All it takes is a simple cheek swab test that gives you unparalleled knowledge to optimise and improve your training, by playing to your unique genetic strengths. 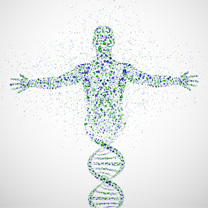 Gene Testing is possibly the biggest game-changer in the health and fitness arena for years. We’ve teamed up with DNAfit to offer Gene Tests to clients, helping them discover exactly the kind of training they respond best to, ensuring better results. For performance and weight management you will find out what sort of foods your body responds best to, and what it may need more, or less of. This ground breaking test is available now for £199 including the one-to-one consultation. Discounts are available for regular PT clients. This includes the test kit, a full hard copy of your report, along with a consultation to present to you and explain the results, implementation and recommendations.